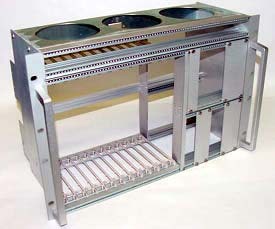 Sub-Rack Card Cages and Chassis Examples - Equipto Electronics, Corp.
Below are several examples of our products. Click here to return to main Sub-Rack Card Cages and Chassis page. Typical 6U euro style card cage featuring aluminum extrusion construction in a clear anodized finish. Card cage featuring fan cutouts. Custom chassis with mounting locations for two power supplies. 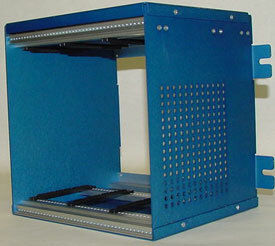 Card cage designed to accommadte both 6U and 3U boards mounted horizontaly. The 3 boards are mounted at the rear to save rack space. 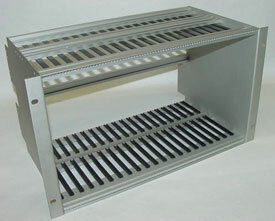 Small card cage for industrial controls. Aluminum with blue anodized finish. 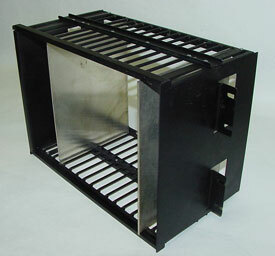 Rack mount aluminum cage cage with in-metal card guides and black anodized finish.